Excel University Volume 1 focuses on the Excel features, functions and techniques that enable you to get your tasks done more quickly. It is designed to establish a firm foundation for your workbooks, and to help reduce errors and improve efficiency in your recurring-use workbooks. 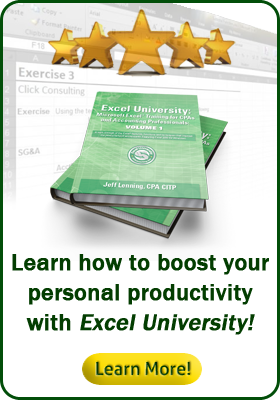 The knowledge in this volume is used throughout the entire Excel University series. You may work at your own speed during the one-year enrollment period. Download instantly once a passing score on the final exam is achieved. You may re-attempt the final exam as many times as necessary. Your enrollment is valid for one year. This course teaches the content of the Excel University Volume 1 book. The book chapters are available digitally inside the course during your enrollment period. Obtaining a printed/bound copy of the book is not required. If you'd like to purchase a printed/bound copy, which is totally optional, you can do so through Amazon. • "This course is well organized, user focused, and interactive. I would recommend it to anyone who creates worksheets in Excel or works in Excel frequently." • "I thoroughly enjoyed this course." • "This course is very useful to accountants because it gives some insights on how to be efficient on the job. Also, gives many keyboard shortcuts that are not usually known to common users like me." • "The class is highly recommended to Finance and Accounting personnel. The webinars are short, and very informative. The quiz allows you to absorb the materials better. The book is very helpful as well." • "Well designed. Broken down to smaller sections, it's easier to follow and practice the newly learnt tips during the homework section." • Clean & clear demonstration. Jeff really nailed this one. It's very easy to follow and he also made it interactive in the forum section. • Good combination of videos/book/homework/blog. Videos are easy to follow, book makes it easier to refer later, homework reinforces and blog appeals to those working better with words than videos. • This course is excellent. Excellent. Excellent. I really like the combination of different media (videos/books/blogs/forum). I also like the smaller sections so you can learn one function at a time. You really understand how we learn and help us get there. • The strength of this course is the instructor himself. He is an accountant who happens to be an Excel expert. He understands what accountants need from the program and what the program can do for accountants. This course and the following series will teach accountants how to use the MS Excel to improve productivity and efficiency. • The one chapter that I appreciate the most is the last chapter "Workbook Design Principles". In my opinion, that chapter and chapters on worksheet/workbook organization should be placed at the beginning of the course material. • It's a GREAT course and it's organized in a format leagues above the usual online learning styles of other e-learning. • I can't wait to try your other advanced courses. • The course was very easy to follow. • It really was one of the best in format I’ve done... I wish all were as well done as that one was! Ensure you have access to Excel for Windows, preferably versions 2010 or higher, so that you may work through the required homework exercises. Excel for Mac is not officially supported, but many students work through using a Mac. Program enrollment is valid for one year and participant must complete the final exam within this time period. To register, add this course to your cart by clicking the Buy Now button and then complete the checkout process. Full 30-day refund; full refund for any course cancellations or registration into upcoming session if preferred. Excel University, Inc. is registered with the National Association of State Boards of Accountancy (NASBA) as a sponsor of continuing professional education on the National Registry of CPE Sponsors. State boards of accountancy have final authority on the acceptance of individual courses for CPE credit. Complaints regarding registered sponsors may be submitted to the National Registry of CPE Sponsors through its website: www.nasbaregistry.org.